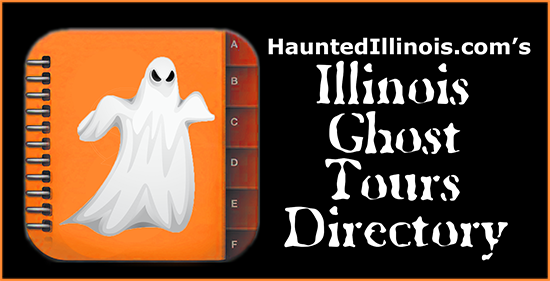 Welcome to HauntedIllinois.com's directory of Illinois Ghost Tours. On this page you will find information about companies that provide tours of Illinois haunted houses, mansions, hotels, theaters, penitentiaries, prisons, sanitariums, hospitals, asylums, graveyards, and other places where supernatural and paranormal activity has been reported. 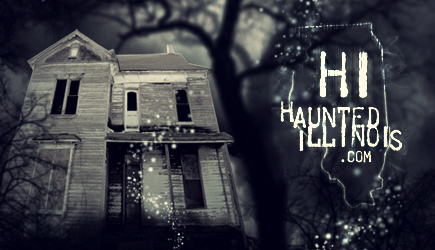 For more information about real haunted places in Illinois, visit our directories of Real Haunted Places and Illinois Paranormal Groups. Your ghost tour company not in this list? Click here to add your ghost tour. * About ALL THINGS that go bump in the DARK! Our Scouts have years of experience dealing with the Unknown. Ghost hunting equipment is available, FREE, for your use during the tour. We have two (2) locations - Oakwood Cemetery in Joliet, IL, and Bluff City Cemetery in Elgin, IL. Don't Miss Out ~ MAKE YOUR RESERVATIONS TODAY! We will see you SOON, in a Cemetery near YOU! The original Main Street walking tour. The stories you will hear are authentic and researched. They are experiences people have had in the past and present. This is a leisurely walking tour of Main and Bench Streets. Trolley tours begin at My Just Desserts, in the historic Simeon Ryder Building. Dating to 1845, the building served as a courthouse during the 1800s and saw cases tried by the young attorney from Springfield, Abraham Lincoln. The evening begins in the second-floor meeting room. After Years of "Ghost Hunting" in several renown haunted and very historical cities throughout our very own United States; Savannah, GA, New Orleans, LA and Saint Augustine, FL., just to name a few... Amelia and her husband Andy decided that they too, wanted to try to delve into Galena's grand history of legends, ghost stories, and paranormal activity. Join us as we spend an evening investigating the old factory and attempt to make contact with the spirits that reside within. Learn about the building's history and true stories of the macabre, and then conduct an actual investigation with the latest in ghost hunting technology. The restless spirits inside the old Elgin Casket Company are waiting for you. Free App of Chicago Haunted Archer Avenue Tour that is an audio and photo tour of 16 haunted locations on Archer Avenue and surrounding areas and has a GPS to take you to each of the stops on the tour. This Free Chicago Ghost Tour App allows you to explore and experience the locations of Haunted Archer Avenue at your own pace to fully experience each location on the tour. The tour is a creation of Chicago Paranormal Host, Psychic Medium and Paranormal Author, Edward Shanahan. He has lived his whole 50 plus years within 5 minutes of most of the locations and has experienced each one of them on a regular basis. On-Line, the best way to buy! At the door as available, but group sizes are limited. Our Ghost Tour Guides will lead you through the streets of Galena by candlelight while sharing ghostly tales and eerie folklore of this very old city. Performed in a true story telling format, with costumed guides, our ghost tour is great fun for all. Our Ghost Walk is offered Friday and Saturday nights at 8:00 PM from May 2017 through October 2017. You can rely on our Ghost Walk to be held rain or shine. (However, Walks may not operate in dangerous or threatening weather.) Be prepared - Dress for the weather! Also wear comfortable shoes. Bug spray in season recommended. Take all the pictures that you like! The Haunted Carlinville Tour from American Hauntings is a historical tour of the hauntings that linger in the small town of Carlinville, Illinois -- home to coal mine history, Sears homes, the "Million Dollar Courthouse," Blackburn College, and a myriad of ghosts -- in the heart of Macoupin County! A spine-tingling and entertaining trip back in time from an award-winning tour company that has been offering history and hauntings tours since 1994! Travel throughout the city of Decatur in search of history, hauntings and spirits! Join us for a journey back into the history of one of America's most haunted towns and discover why Decatur has earned a reputation for ghosts and the unexplained. From old theaters to haunted houses, railroad stations and ghostly graveyards, you'll have the chance to possibly meet some of the past residents of the city face-to-face! Discover the History & Hauntings of the Illinois Prairie as the Haunted Jacksonville Tour from American Hauntings returns to offer a chilling new look at the lingering spirits of Jacksonville's historic downtown! Journey back in time and discover the events of the past that have created the hauntings of today! We have different tours monthly. With several in October! Come on out as we forge thru the several places of documented �activity areas�. We will show you the how and why. Grabbed right out of the pages of the �Peoria Historical Society�. We will review the evidence the CIPITeam discovered and with our own in town Psychic Mz. Kaye as our guide, we shall travel and discover ourselves. [She will also show us how to tell the difference]. Listen, spellbound, as expert storytellers bring Naperville's surprising wealth of haunted history back to life. true paranormal encounters of Naperville's ghost stories. Hunt for ghosts during your ghost tour using genuine EMF Ghost Meters provided FREE for your use. Perhaps your EMF meter will suddenly flash, and you'll experience first-hand the breathless excitement of knowing a ghost may be standing right in front of you!! The only tour of the haunted Mineral Springs Mall in Alton, IL. Alton has been called one of the "Most Haunted Towns in America" and our tours are the best way to learn about and experience the best paranormal activity that Alton has to offer. In addition to our standard walking tours, we also offer exclusive "Haunted Overnights" which allow you to camp out in the old haunted pool inside the basement of the hotel. Pre-paid reservations are required for haunted overnights, so make sure to check the Tour Calendar and reserve your spot today! Ghost tours by Kevin Frantz, a Naperville Historian and Professional Storyteller, with 13 years experience. He has hosted the Official Ghost Tour of Naperville for 11 years and is the author of two best-selling books about Naperville ghost encounters. Springfield Walks is Springfield's premiere tour and guide service company bringing you all the history and mystery that Lincoln's Springfield has to offer. Did you ever want to see what a real paranormal investigation is all about? This is your chance to find out! This exciting event will let you be the paranormal investigator! Guests will be in small groups as you join the staff in the most active locations in the Cottage. You are welcome & encouraged to bring your own equipment. Each event begins in the Barn. Join us for scintillating tales from paranormal experts, listen to audio clips found in the Tinker Cottage, and enjoy a tour with the chance to have your own paranormal encounter. You are welcome and encouraged to bring your own equipment. Each event begins in the Barn. According to legend, author Mark Twain once called Alton a "dismal little river town," largely thanks to the dark history that the city had already endured prior to its heyday as a thriving river port. From those days, through the early 1900s, Alton saw more than its share of death, disease, disaster, violence, murder and even the scars of the Civil War. Now, come see how the events of the past have created the hauntings of what is now being called "one of the most haunted small towns in America." Our tours follow a course of history that starts with the very beginnings of Chicago, traveling from its humble origins as a frontier outpost, through the 19th century -- including the Great Chicago Fire and its aftermath--, into the 20th century and the gangster era of the 1920s and 1930s, and forward to today. We cover a lot of information and many, many stories. There is no exact formula,and we don't set out to scare. Rather, we let the history speak for itself. It never fails.